Estonian horses (also known as Estonian native, Estonian Klepper, or natively Eesti hobune) are a relatively small horse. The Estonian horse has influenced several Baltic horse breeds, including Tori horses. They are strong and are resistant against sickness. Estonian Horses are descended from the primitive forest horses that lived in Northern Europe more than 5,000 years ago, and are considered the progenitor of other breeds such as the North Swedish Horse and the Dole Gudbrandsdal. They have retained its qualities and looks due to little influence by other horse breeds. However, it is believed that they became mixed with the now extinct Oland Horse, as large numbers of Oland Horses were exported to Estonia at one point. Tests authorised by associations dedicated to the Oland Horse have revealed that these two breeds have a genetically similar background. They became popular throughout the Baltic countries for their strength and suitability for farm work. Many were sold to Russians as early as the 14th and 15th centuries. They were also imported to Sweden for military use. Development of agriculture resulted in good working horses becoming even more desirable, and many Estonian Horses were crossbred with heavier draft horses to create stronger animals. The first documents concerning attempts to improve the Estonian Horse are from the founding of the Tori stud in 1856. The breed was then crossbred with lighter working horse and riding horse breeds. The best offspring resulting from these attempts became the foundation of the Tori horse. One of the most successful sires, Vansikasa, was foaled at the stud. He became well known for his exceptional strength, pulling skill and indomitability, and one of his daughters was the founding mare of the Tori Horse. Even the Vyatka horse was influenced by the Estonian Horse. After the First World War a breeding program was created to help preserve the breed whose numbers had fallen quite a lot during the war. "Estonian Native Horse Breeders Society" and an Estonian Horse studbook were founded in 1921. 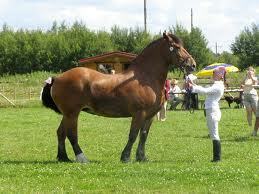 By 1937, only 13 stallions had been used, and the Estonian horse was becoming inbred due to the scarcity of strains. This led to horses reaching maturity later, and slowed down the development of the breed. With the mechanisation of transport and agriculture, horses became obsolete and the breed nearly died out, excluding the islands of Saaremaa and Hiiumaa. With a few animals left on the mainland, the breed was eventually revived with the help of a new breeding program, and the breed's population has now reached circa 1000 animals in Estonia. The breed has recently been crossbred with Finnhorses to enhance its size, but it should be noted that both of these breeds are descended from the Forest Horse. In 1992 the association started anew after having been down for the 1980s. In 2000, an association was founded to preserve the breed. In 2005, 25 animals of the breed were imported to Sweden to recreate the genetically closely related, extinct Oland Horse. The new Öland horse is not called that, however, but the "Estonian Bush Pony". They are rather small, measuring 14.3 hands (59 inches, 150 cm) at the withers. It is strong, yet not heavily built. The most common colorations are black, bay, chestnut, and grey.The breed is a tireless and powerful puller, and is well suited to agricultural work with its easy temperament. This has contributed for the breed's use as a children's riding horse, a major reason for why the breed was able to survive. Most breeders let their herds live under natural pasture conditions except during wintertime, and the breed lives well on forage alone. This has made the breed healthy and durable with hard feet. Their appearance is not exceptional. The head is small with straight profile and primitive facial features. The breed is willing and easy to handle, inexpensive to keep, and often long-lived. The breed is nowadays used for tourist rides. Finland has a breed association for the Estonian Horse.